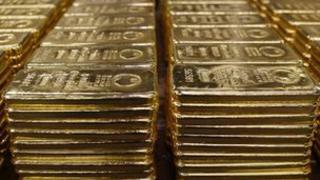 Cyprus may sell off some of its gold reserves to help finance part of its bailout, according to reports. An assessment by the European Commission says Cyprus must sell about 400m euros (£341m) worth of gold. The country has already been forced to wind down one of its largest banks in order to qualify for a 10bn euro lifeline from international lenders. At current prices, 400m euros' worth of gold amounts to about 10.36 tonnes of metal. If reports of a sale by the Financial Times and news agencies are correct, it would be the biggest bullion sale by a eurozone central bank since France sold 17.4 tonnes in the first half of 2009. Analysts say it is very unlikely that other European Union states will become big sellers of the precious metal. Portugal holds 382.5 tonnes of gold, worth some 14.76bn euros at current prices, in its reserves, while Spain's holdings stand at 281.6 tonnes, worth 10.8bn euros. Italy is the world's fourth-largest gold holder, with 2,451.8 tonnes, worth 94.6bn euros.